Pay a virtual visit to the Château of Azay-le-Rideau - one of a number of Châteaux located in the Touraine very near the Loire and Indre Rivers in central France. The Château of Azay-le-Rideau looks like it's come straight out of a fairytale book. This Renaissance Chateau is surrounded by water and parkland. To visit it I had to cross a bridgeover the River Indre to get to its main entrance. It was built by Gilles de Berthelot between1518 and 1529. His role was Treasurer to King François I and as might be expected, he was a wealthy man in his own right. His wife Philippa was responsible for supervising the work. The chateau is actually located and built on the foundations of a much older medieval fortress which was burned down. Inside you can visit a range of rooms from the State apartments to the kitchen and see colourful and intricate tapestries and fascinating and sometimes funny stone carvings of naughty cherubs and animals. You might think it stands quite high in the water. However you need to remember that this is not a moat with a static and controllable water level. The water is a real river - the River Indre - which is going to change in levels through the seasons and over time. However the flow has been slowed right down - which means that the water around about has a mirror-like surface. This, of course reflects the Château and its turrets which gives its an even greater impact. It has been owned by the French State since 1905 and today it is run by the Centre des monuments nationaux (click the link and listen to very nice man speak to you in French!). Azay-le-Rideau is located in the Indre-et-Loire département, of the Centre région, in central France. This département, has a very large number of chateaux lying near one or the other of two important rivers which give it its name. I'd HIGHLY RECOMMEND a visit to the Château of Azay-le-Rideau. Allow a minimum of 90 minutes. Azay-le-Rideau is a small castle, charming and romantic. 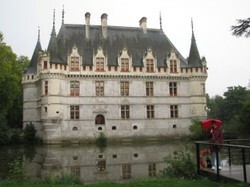 It is located in the Loire Valley, 15 miles southwest of Tours (and about 150 miles southwest of Paris). The Château of Azay-le-Rideau was built from 1515 to 1527, one of the earliest French Renaissance châteaux. Built on an island in the Indre River, its foundations rise straight out of the water. Azay-Le-Rideau is located some15 miles south west of Tours in the Centre region of France. It's south east of the River Loire and it's very well signposted! follow the D57 from the Loire. Note this turns south just before the chateau while you need to keep going east. the River Indre is built on an island in the middle of the River Indre. This creates the water which surrounds the chateau on all sides. My recollection is that there is no parking in the vicinity of the chateau and that you have to park in the town and walk for a few minutes. It's very pleasant to walk by the river as we did. One of the big features of the Chateau is the amount and the quality of the stone carvings. Reine Claude of France was the Queen consort to her King Francis I - her emblem was the ermine. For those looking for a great French garden you'll be disappointed. This Chateau focuses on parkland and there's no sense of any flower garden. or vegetable garden that I could see. However we went at the beginning of Autumn and it looked like the changing leaves could make for a very attractive site. When trying to get round as many chateaux as possible, it's easy to miss the environment round about. Fortunately we needed to park on the other side of Azay-le-Rideau and walk across. We found this small town to be delightful and quiet. It's a great place to stock up on all those odds and ends you need when travelling round. We bought baguettes for lunch, stamps for postcards and batteries for a camera without difficulty. Azay-le-Rideau is a commune of the Indre-et-Loire department in central France. Have you visited the Château of Azay-le-Rideau? Would you like to visit? I was in France a couple of years ago but didn't make it to that area. It looks beautiful. I would love to visit the Château of Azay-le-Rideau! I was always fascinated by French history when at school and disappointed that we never covered it, apart from the French Revolution. I never visited Azay-le-Rideau. I may suggest this next time family or friend come visit me from Canada..instead of going again to Chenonceau or Cheverny. Well, here is another place to add to my bucket list...simply gorgeous. Oh how beautiful. Such majesty. Really beautiful place. Katherine, it makes me want to take off now from Downunder - the images are great and I share Anne's appreciation of the cobbled stone streets. I have longed to make the trip to Paris and I will one day soon. The Château of Azay-le-Rideau looks truly mystical.